Click here to donate. When you contribute $144 (or $12 a month), you can choose the KAZU insulated travel mug. 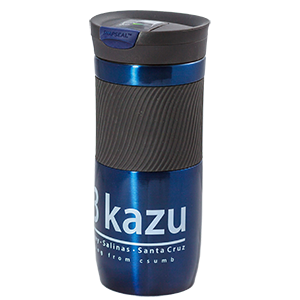 Listen to KAZU on the go while sipping your favorite hot beverage from our 20 oz insulated, dark blue stainless steel travel mug by Contigo. This mug features a one-piece leak-proof lid that allows for quick and easy cleaning. The lid easily snaps up for drinking and snaps closed to seal once you've finished. This vacuum-insulated travel mug has a comfortable grip that provides convenient one-handed drinking for both left- and right-handed users. The mug also fits most car cup-holders as well as most single-serve brewers. It also features a dishwasher-safe lid for easy cleaning. Show off your smarts and your style by sporting your 90.3 KAZU Travel Mug everywhere you go.